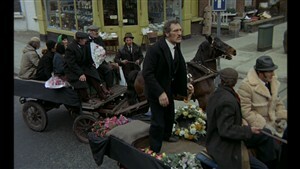 These screen grabs are taken from a 1972 film. I believe they show the view north-west along Harrow Road from the corner of Fifth Avenue. The corner building at that location, No. 690 Harrow Road, was once a bakers and the junk shop clearly shows old Hovis signs on the window. The next building along, No. 692 Harrow Road, was Robert A Jones & Son, undertaker. Sadly that stretch of Harrow Road has been demolished since 1972 so I cannot confirm or deny the location. Can anyone assist? This page was added by Christopher Matheson on 03/10/2012. 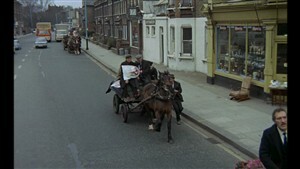 this is harrow road the clips are from Steptoe and son (2nd film) and shows parade along harrow road up to Burtons on corner of Fernhead / Walterton road also part filmed in Goldney road w9 and Kensal green cemetery and the old St Marys hospital which was located opposite Sutherland avenue. l have been trying to find the name of a departmental store (1950s/60s) selling clothes shoes ect. can anyone tell me the name.. l dont know why l have BRADLEY AND PERRINGS in my mind.. but someone said it could be burtons.. it was near the prince of wales harrow road.